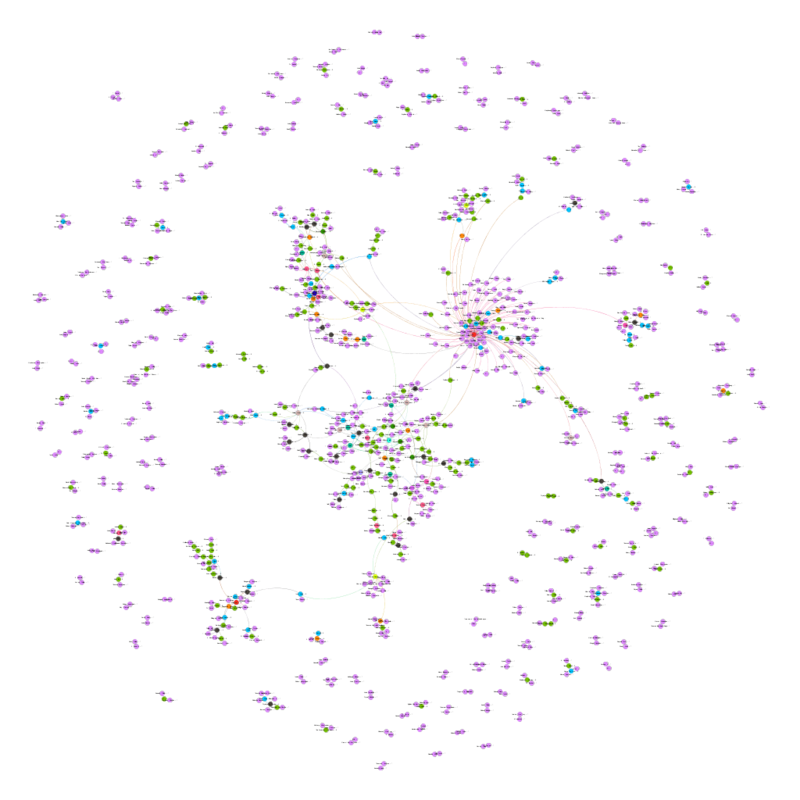 This visualization is perhaps the most representative of the true English recusant print network. This graph is the combined records from the demonstration data and the EEBO-TCP data which indicate an English printing location. 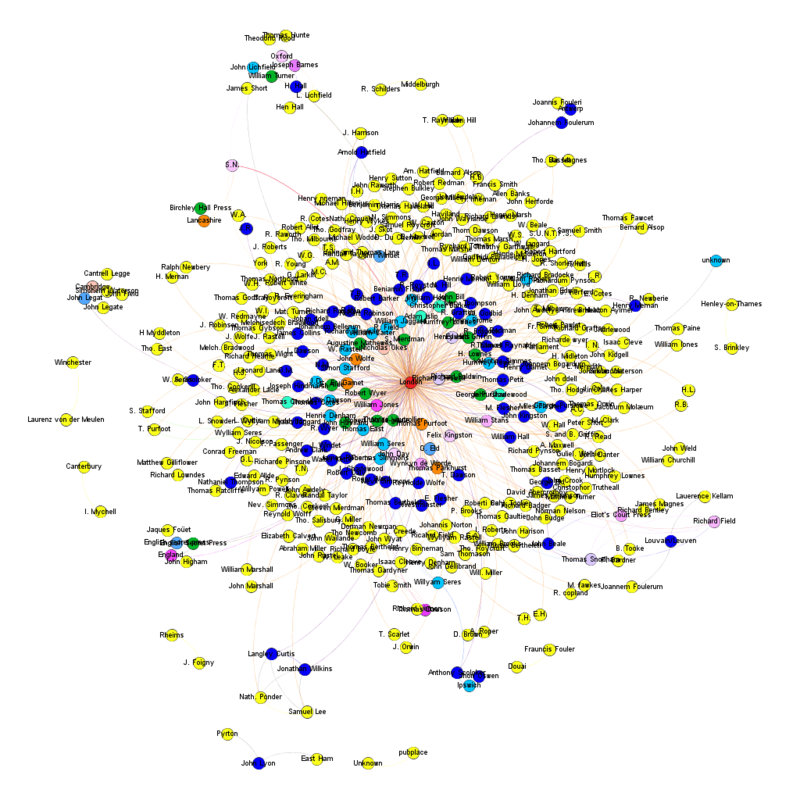 This visualization illustrates two main components of importance, firstly the inner, multi-colored ring represents printers of multiple works where blue indicates printers of two works and accounts for 16% of the total merged data. There is a sharp drop-off of printers who produced three (light blue, 5.2%) and four works (green, 4%). With each drop in the number of printers represented, however, the more interesting the nodes become. The printers in the pink hues represent those with a printing rate between nine and twenty-one. These individual printers represent only a small percentage of the network, but whose output far exceeds many other printers. These names include people such as John Day (nineteen associated works), William Jones, and Felix Kingston. 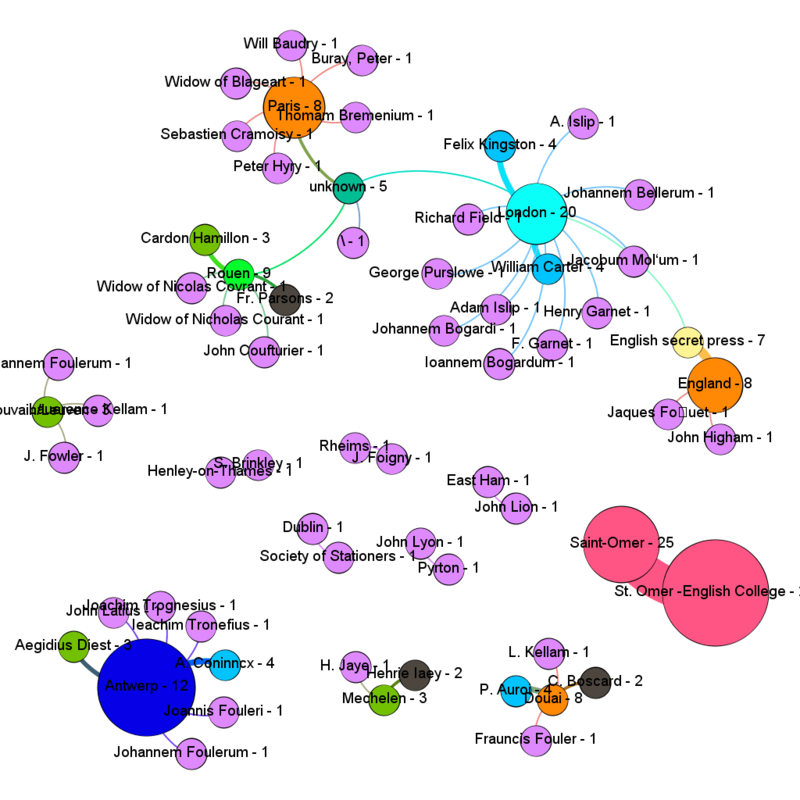 Additionally, this visualization, while cluttered demonstrates some of the connections between these printers as partners such as the aforementioned John Day is connected to his colleague William Seres. Secondly, this graph illustrates the largest of the data in yellow. These nodes equate to printers with only one associated record. These one-offs account for 67% of the data and while not immediately interesting may indicate an area of further study. Particular names that fall into this category are some of the names associated with William Carter. Thinking about the preponderance of false imprints throughout the data, the number of single occurrence works makes sense due to the potential for false names and locations in order to disguise a more well-known or legitimate printer within the stationer’s record. Looking at a small network for four printers associated, according to the ESTC with London, may indicate the partial future for this project. While the majority of the single occurrence nodes are not directly, at this time, connected with other nodes other than location, it is interesting the connection demonstrated in the cluster containing Langley Curtis, Jonathan Wilkins, Nath. Ponder, and Samuel Lee. Curtis and Wilkins are each indicated as being the printer of two works, and Ponder and Lee one work each. In looking back through the data, these printers are associated as co-creators on a particular work and associated separately otherwise. Demonstrating these connections and illustrating how individual printer nodes are related to one another is the eventual goal of this project. The visualizations created for this early stage in the project serve largely as a proof-of-concept and do not fully represent the possibilities for future analysis. This visualization utilizes the demonstration dataset and is an attempt rectify data from the “false imprint” information and the ESTC scholarship connections between pseudonyms and a printer’s supposed real name. As has been previously discussed, the case of William Carter was a very intriguing finding with this research and one I was tipped-off to through both the reoccurrence of his name in the visualizations and through the ESTC records indicating the names “Johannem Bogardi,” “Ioannem Bogardum,” and “Iohannem Bellerum” are all to be associated with William Carter and that the imprint location, typically Douai, is false.All of these names associated with recusant literature and found within both the demonstration dataset and the EEBO-TCP data and, interestingly, may add to the number of works Carter is said to be responsible for. With this information, the English recusant print network began to take shape. This graph, while incomplete, represents some of the shape that future efforts may take with this project. Ultimately the question posed on the “Working Thesis” page remains to be answered. Does this study positively contribute to the historiography of recusancy? While the data is incomplete I think there is a conclusion to be drawn. When viewing the vastness of the printing network both in visualizations illustrating the global network and what the ESTC notes as the English network, we see a vast scope of actors working either within the Jesuit printing mission or as a part of the English Catholic community. In particular we see a band of as of now unaffiliated nodes which represent, potentially, a larger scale of recusant printing by lesser or unknown printers, or we see the evidence of a larger scope of aliases and clandestine practices throughout the country. Taken as such, this evidence may work to lend modern credibility to John Bossy’s thesis of a reborn and robust Catholic community that may have emerged as a factor of the post-Tridentine Church. This is the first visualization of the seven total, and first of the two demonstration datasets illustrates the standard idea that the majority of the recusant literature was produced outside of England at printing centers such as Saint-Omer (northern France), Douai, Antwerp, and Paris . In fact, Saint-Omer, first site of the English College established by William Allen, alone accounts for nearly 24% of the 105 records used in this set In fact, the European centers account for a dramatic 66% while London accounts for merely 19% alone or, slightly more interestingly 28% of the imprints when combined with the entries Henley-on-Thames, East Ham, and the very generic England (generally associated with the equally vague “English Secret Press” note from the ESTC). Because of the complicated history with the settlement in Dublin, I have chosen to neither count this entry as Europe (unrestricted Catholic printing) or England despite the Anglican establishment there. The data used for this visualization is derived solely from the item imprint information and does not account for the “false imprint” information as will be expanded on below. Taking these items at face value, then, gives us a visualized graph of the traditional makeup of recusant printing. Because this was a small sample, however, it was intriguing to see that 28% of the records noted an English printing location; more than would be assumed, perhaps, through a reading of the secondary literature. As this simple bubble graph illustrates, the EEBO-TCP data provides a more expansive look at the location occurrence rates suggested by the demonstration dataset. In this graph, however, the trend illustrated previously of more English printing occurrence than originally assumed is dramatically expanded. Using the EEBO-TCP data which pulls from the ESTC MARC metadata, we find that 682 of the 962 “Catholic Church — Controversial literature — Early works to 1800” records pulled from the larger dataset indicate London as the place of printing and thus accounting for about 71% of this set. When compared to the network analysis in figure 5, we can see that the majority of these 682 records associated with London are single instance records (indicated in purple) and account for 68.31% of this data. Additionally, the EEBO-TCP data is representative of the bias towards ascribing a large majority of the imprints as false. If this scholarship is correct, this would be a definite shift in the understanding of recusant literature. This would indicate that the instances of literature being created in Europe would be lower than those printed on clandestine presses in England. I approach this conclusion with a great deal of skepticism despite my general fondness for notion, after Bossy, that the English Catholic community was not a passive population, but the numbers may indicate a printing community and printing rate that, because of the secrecy needed, would be potentially difficult to maintain. There are, perhaps, other explanations including piracy or at least larger scale unlicensed printing of recusant texts but with without ideology. More likely, however, could be that a visualization of STC/ESTC speculative scholarship may highlight a level of caviler assignation of a theory that when displayed in graphical and condensed form betrays some of the faults not seen when spread throughout the database. In the “Rates of Printing (Demo DS)” visualization, the locations of printing were the primary focus and illustrated the amount per location that records were attributed to that place. In the second visualization the emphasis is on the printers themselves. In this graph the print centers form a sort of hub that splinters into both personal and corporate printer names (ex. Cardon Hamillon or The English College Press). 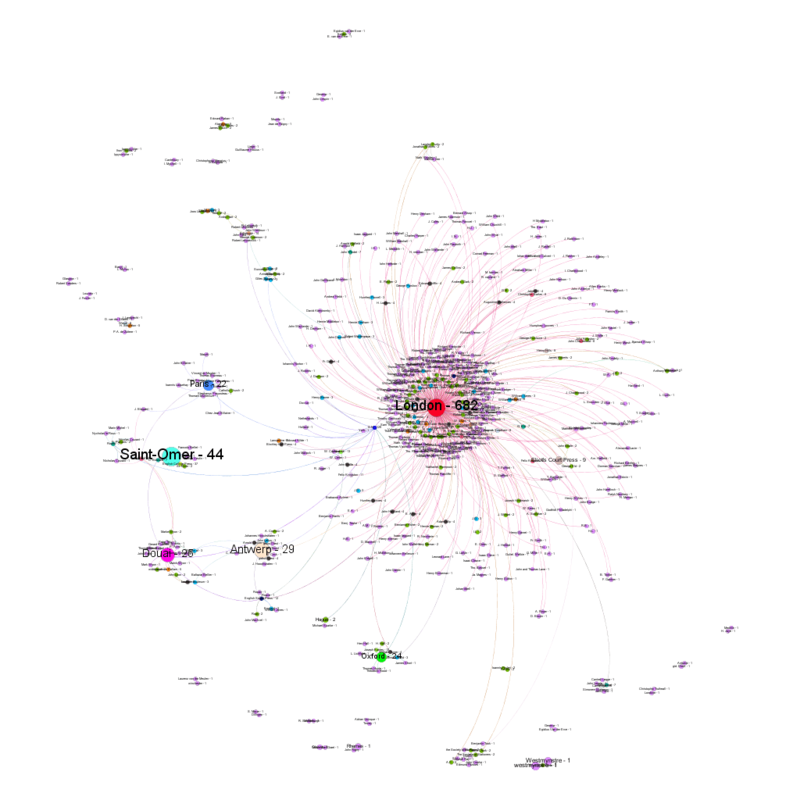 What stands out immediately when with this visualization is the occurrence frequency of certain names such as Joannem Foulerum and a splintering of their location being both labeled as Antwerp and Louvain in this example. Similarly, we see Lawrence Kellam located in both the Mechelen and the Louvain hubs. Granted, all three of these locations are in Belgium, but curious trends can be seen in this graph and can be attributed, somewhat, to the potential false imprint information. What this graph illustrates is that within the demonstration data, we can observe some of the inconsistencies and vagaries of location either out of simple error or potentially deriving from the printer not printing from the location labeled due to careful but deceitful clandestine practices or through a simple copy error due to the imprint being in Latin. This graph represents the rates of Recusant Literature authors and the co-occurrence with the location. In addition to the on-going and discussed problem of potential false imprints the considerably high rates of S.N. (sine nomine) entries changes the shape of the data somewhat. In all of the visualizations illustrating the connected network of printers, the most common connection is between S.N. and London. This is unfortunate as it clouds the effectiveness of the data at present and will need to be normalized against in future work with this tool. This chart illustrates the use of the terms recusant, recusants, church papists, and clandestine catholics from the 16th to the 21st century. This chart is simply illustrative of some of the text mining work that I may work with as this project continues.